The week I'm featuring: La Iglesia. The Spanish conquest brought two major legacies to Mexico: The Spanish language, and Catholicism. There are many Catholic churches in Mexico which are some of the most beautiful buildings I’ve ever seen. 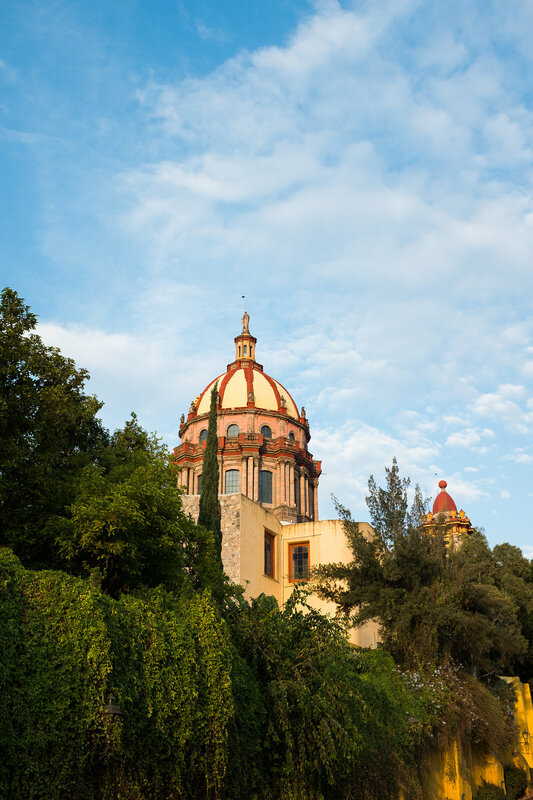 This particular church is located in San Miguel de Allende and is one that can be seen from almost anywhere in the city. For such an iconic picture, this framed print would be a great statement piece for a living room. The green and blue is so vibrant that you want it to be the pop and really draw the eye. 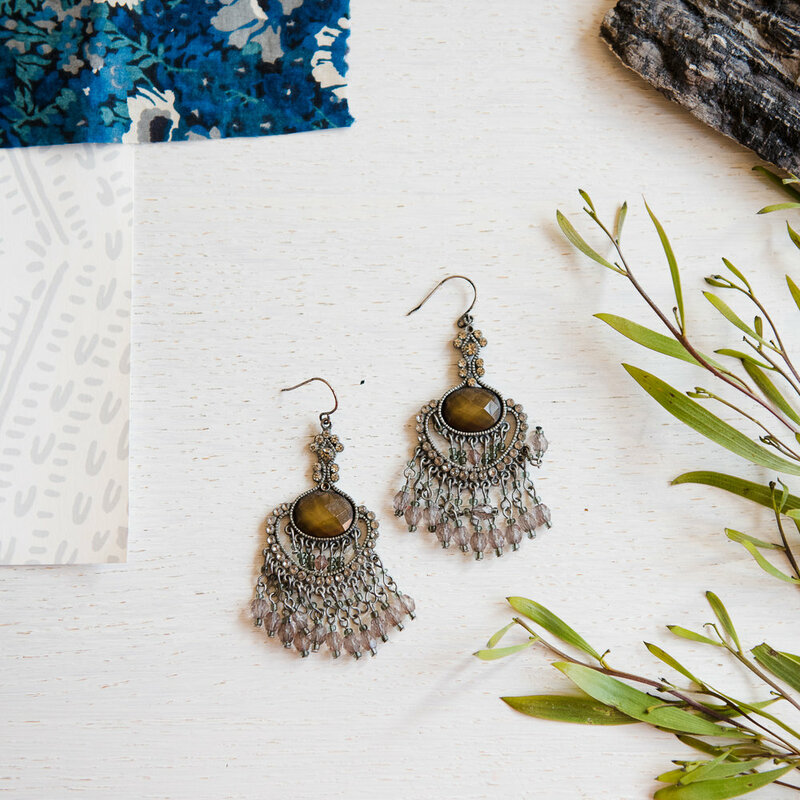 Pairing this with neutral accessories will do just that. I love all of these accents to really make this photo a focal point. 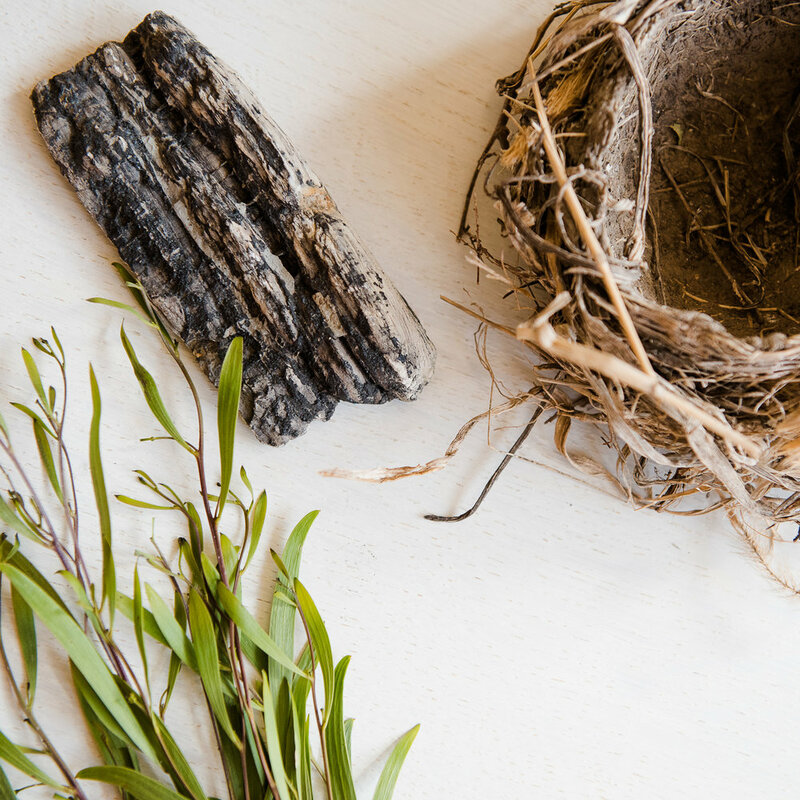 You can also draw from the greens in the photo to add more greenery to your room. In the mood board for this bedroom, I love how the deep colors in the photo, are being drawn into other items in the room. I mean that orange bed is everything, and that golden chandelier. Yes and YES! I love how the room has light whites and grays with a few bold pops of color that accent the photo. Mylene, you've done it again both of these mood boards are perfection! This week only (until Sunday), I'm offering free framing on all orders of the "La Iglesia" print. Let me know if you have any questions about this design mood board, or this specific print. Send me an e-mail or leave a comment below. I'm doing a series on my San Miguel Collection prints and am collaborating with interior stylist Mylene Raspado. I'm hoping to make it easier for you to picture these fine art photographs in your home by giving you two mood boards for two different spaces in your home. The week I'm featuring: Nopalitos. The Spanish word for cactus is nopal. "Nopalitos" means little cactuses. Mexico has many plants like the cactus that can survive hot temperatures, which often leads to them being common decorative plants in homes. We actually have this photo hanging in our living room/dining room space. It's neutral colors really leaves the door open for bolder color choices in your decor. I love the dark grays, purples, and greens to tie your space together. We have this print in a 24x36 size on one of our side walls in our living room, as a statement piece. Usually Mexico is known for vibrant colors, but I think this photo still represents Mexico using neutral warm tones. A bathroom can be a hard space to decorate. At least for me it's the last room in the house to get some love. I especially love how Mylene pulled the rose gold color from this photos to use as accents with the towel holder and toilet paper holder. Genius! This week only (until Sunday), I'm offering free framing on all orders of this Nopalitos print. 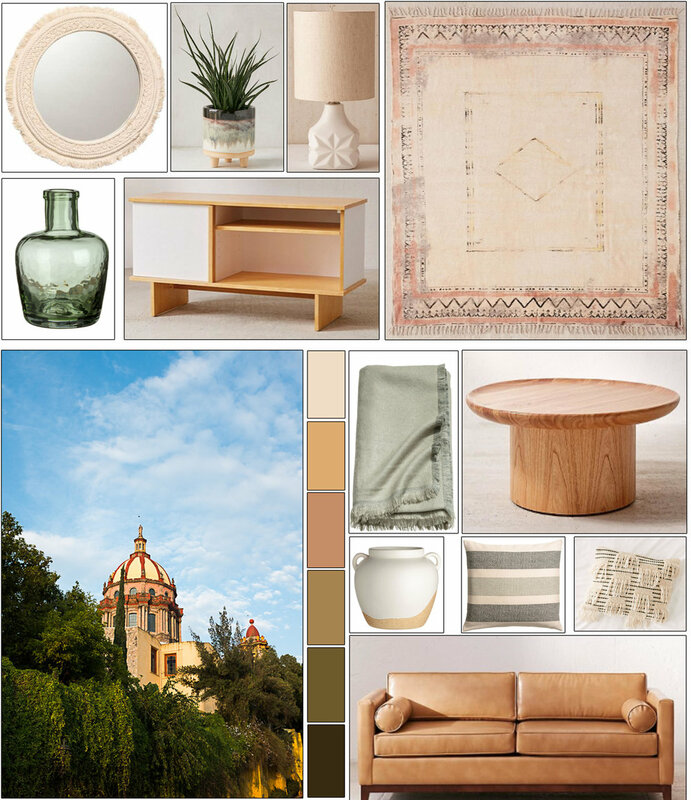 Let me know if you have any questions about this design mood board, or this specific print. Send me an e-mail or leave a comment below. I visited San Miguel de Allende, Mexico last month so I could tell you more about it and add new photos to the current San Miguel Collection. On my first trip to San Miguel last year, I was developing the idea for Karina Mora Prints, so I wanted to return now that I had a clear vision for the photos I wanted to offer. I have a few pictures hanging at Sip Coffee House for the month of March, and I thought I'd do a feature on one of the prints as a preview to a new collection coming later this summer. I worked with Kandy from Meandering Design to create a mood board for this print called "La Ventana," which means 'the window' in Spanish. "The adventurer is a little quiet and a slight romantic. You’ll usually find her taking walks along the beach, picking up sand and stones or hiking up a mountain. She is often up in the early morning going for a walk and bringing home a bit of nature with her." I feel like this photograph really speaks to the person who has an adventurous spirit. Saving up for an adventure is what keeps her going. As I wandered San Miguel de Allende last month, I watched people slowly walk through the town wearing beach-like hats and exploring the small shops and their various wares. The shops throughout the town have hand-made clothing, jewelry, pottery, and home decor. Each shop owner has such a deep passion for their craft, which is evident by the items on display. Finding a little piece from each trip keeps the memories from each adventure alive, and collecting pieces that speak to your soul keep you excited for your next trip. A beautiful piece of art is something to look forward to when you come home each day. Who knows what ideas of travel it may spark. "La Ventana" was taken in San Miguel de Allende, Mexico. The homes are colorful and bright, making you feel welcome before you even step inside. Most windows are adorned with little plants that are more for the people that pass by to enjoy. The two colors of this home along with the vibrant green of the plants really caught my attention. The simple design stirred a peaceful feeling in me, making this my favorite window from my trip. If you'd like to order this print, send me a message. This is not available in the shop, but this month only I'll take private orders and offer free framing just for being a blog reader. Send me an e-mail or leave a comment below if you're interested in ordering. The week I'm featuring: Guanajuato Street. Guanajuato City is the capital of Guanajuato in Mexico. It's known for its silver mining history and colonial architecture. It's definitely a place to visit. This week's mood boards are so exciting for me. I must admit that I'm not one to be drawn to men's fashion or even think about designing for a man's space. However, since having a son, I've been trying so hard to plan out some great birthday themes, find "cool" outfits for him to wear, and this year I'm even planning to re design his bedroom. This first mood board was designed with a teen boy in mind. I love the muted colors that give off a playful, yet mature vibe. Continuing with the male design theme, this next mood board was designed with more sophistication in mind. This print would go well in a guy's dorm room, or a man's living room. (I mean I'd even design MY living room like this) Essentially this print will follow my son as he grows because I love both of these mood boards. This week only (until Sunday), I'm offering free framing on all orders of this Guanajuato Street print. Let me know if you have any questions about this design mood board, or this specific print. Send me an e-mail or leave a comment below. The week I'm featuring: FLORAL WINDOW. In the residential areas it felt like the vines and trees were part of the architecture of each house. The different varieties of flowers add to the color and vibrancy of Mexican decor. If you're in the midwest and experiencing the winter weather, you know we're probably only half way through. As you spend more time at home enjoying warm cups of coffee or hot chocolate, you might be inspired to update a few rooms. Updating the art on your walls can be a quick and simple way to change the mood of your space. This floral print would look beautiful in a bedroom or a guest room. You can see and almost feel the sunshine coming through. 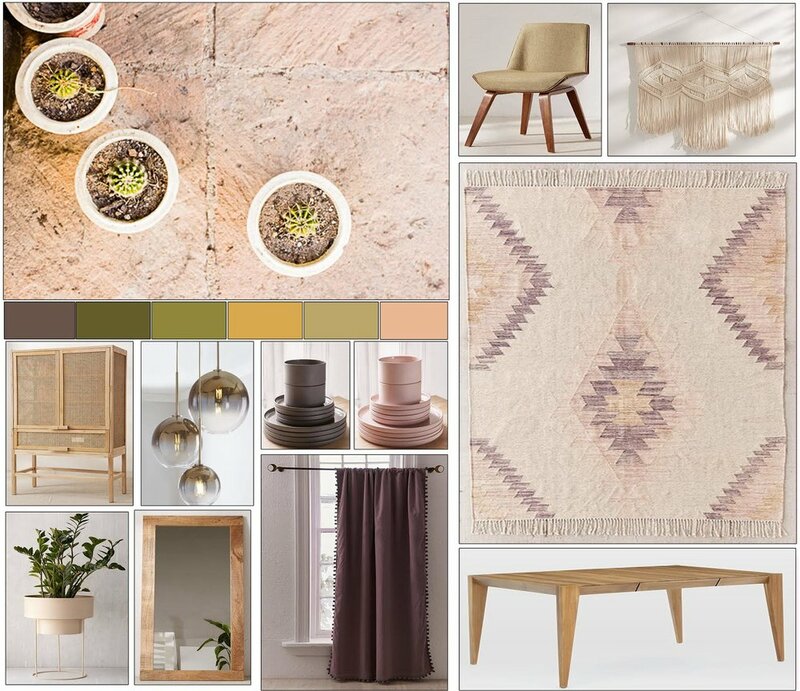 I love the earthly tones in this mood board. This color palette is very versatile feeling fresh, relaxing, and comforting. Drawing from the greens in the vines you can use that color in the accents like a rug, or other decor. You could use the hint of pink in the flowers for accents in pillows, or other wall decor. This photo adds a brightness to a room, so you can also pair it with a more neutral palette. I can also see this print hanging in your living room. You can add accents of gold, wood, or white to make the space light and airy. This week only (until Sunday Jan 28), I'm offering free framing on all orders of this FLORAL WINDOW print. 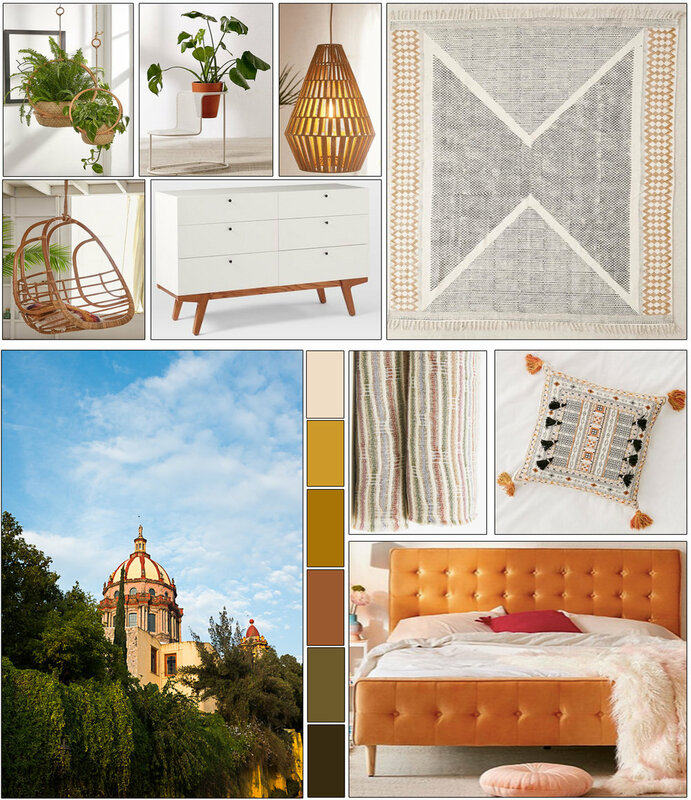 Let me know if you have any questions about this design mood board, or this specific print. Send me an e-mail or leave a comment below.